Welcome to the real world! 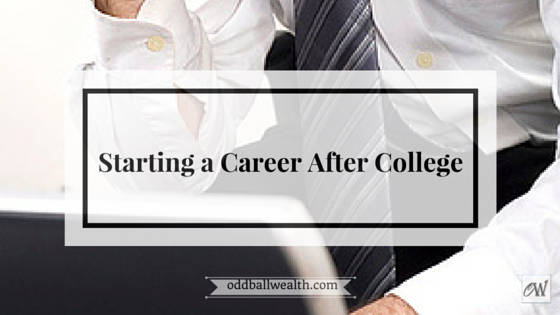 Now that you’ve graduated college, you’re probably going to want to start looking for a job and begin your career. Eventually you’ll have to begin repaying your student loans and have other expenses to pay for. A lot of fun, I know. You can avoid a lot of stress in the future by getting yourself organized now and securing a job. To help get you organized and prepared for your job search I put together this awesome guide on How to Dominate the Job Market after Graduating College to Land Your Dream Job. This career guide was designed specifically with the college graduate in mind and to help you transition from being a student to starting your first career. A few of you might be fortunate enough to delay immediately starting a career after graduation to travel and explore different cultures. If you have the opportunity to do something such as traveling after college I highly recommend doing it. Once you start a career you’ll start to find out you have less and less time to do certain things. It becomes much more difficult to just pack up and go travel for a couple of months. If planned correctly, traveling can be pretty cheap and can be done on a budget. Most of us however are not that fortunate and have bills and other expenses that need to be met. It might be time to upgrade your vehicle from the one you drove in college and purchase a more reliable vehicle so you can get to and from work without breaking down. I don’t recommend buying a brand new vehicle, you can get more value and save a lot of money by buying a gently used vehicle instead. It’s time to start paying off that giant stack of student debt you racked up in college, if you had to take out student loans to help pay for your pricey education. You’ll need a job to pay for rent and afford to have a place to live. You’ll also need to pay for items like food, utilities, car insurance, renters insurance, health insurance, dress clothes for your new career, phone bill, internet bill, and much more. The list goes on, and on. For some people, the transition from college life to real life is a breeze. But for the majority of college graduates the struggle is real. It takes time to fully transition before you really start getting a grasp on things. Until now you spent your entire life in school, for most of you, school is all you have known. You went to class, did your homework, and studied for tests and exams year-after-year. Unfortunately, school never taught us how to prepare for the real world. Growing up you were told by your parents, teachers, the media, and the rest of society that you had to go to college. If you didn’t you would be financially poor and never get a good job. It’s no surprise that millennial’s are the most highly educated generation ever in history. Since our generation all have college degrees, it’s also no surprise that a college degree no longer gives job candidates the competitive edge that a college degree gave our parents or grandparents generation. Also, college is much more expensive than it was for our parents or grandparents generation. Kind of ironic considering a college degree offers much less value to the holder than it used to, but at the same time cost a lot more than it used too. Which contributed to millennials having more student loan debt than any other generation in history. In fact, the amount of student debt our country has outstanding is so high many financial analyst and government officials are becoming very concerned because of it, and they have a very good reason to be. Generally, you have a six month grace period before your student loans become due. The loans grace period begins taking effect the day you graduate or when your status as a student drops from full-time to only part-time. Due to poor academic planning on my part, a required class I needed take was only offered during the fall semesters and wasn’t available during the spring semester, which was supposed to be my last semester. As a consequence I wasn’t able to take that class until the following fall semester. When I finished the spring semester (the semester I was supposed to graduate) my student enrollment status immediately dropped from a full-time student to only a part-time student, since I was only taking one class that following fall semester. The grace period for my loans started immediately when the spring semester ended and my status dropped to only a part-time student. When I graduated that following December my student loans became due for repayment immediately since my six-month grace period was up. At first, I was a little worried because I didn’t have a full-time job yet. Fortunately, I was still working the part-time job I had in college and my income from that job allowed me to pay the minimum payments on my student loans which were lower than I originally intended them to be. If you’re still in college and plan on graduating within a semester or two, get organized and do the proper academic planning in advance. Make certain that you’ll be able to take all the required classes and complete any other program requirements by the time you plan on graduating. If you recently graduated and have student loans, check to see when you’ll need to begin repaying them. If you can get a job before you have to begin repaying your student loans, you’ll save yourself a lot of stress and headaches. In the U.S. alone there is over $1.2 trillion in outstanding student loan debt and with over 40 million borrows. Every year, billions of dollars’ worth of unsecured student loans are given to college students who don’t have a credit history and have absolutely no assets to back the loans should they default. Remember a few years back when our economy went into a recession because banks were giving mortgages to thousands of people who couldn’t afford to make the payments on those mortgages? If you remember correctly, the outcome was very bad and everyone began defaulting on their mortgages around the same time, sending our economy into one of the worst recessions in history. The only difference is a mortgage is backed by a physical asset, the home itself. Whereas student loans are backed by absolutely nothing except the good faith that a kid just out of high school receiving the loan will pay it back someday. Technically, if too many people default or start missing payments on their student loans, it could essentially collapse our economy and send us back into another recession. As a college student you would never think you were nurtured in college while juggling different classes, homework assignments, typing papers, making presentations, and studying for exams. But even though you may not have realized it, you were nurtured in college. This is important for you to understand because the real world is the exact opposite. When you were in college and didn’t understand a topic or couldn’t figure out how to do something, your professor was more than happy to take the time to sit down with you and help you understand it. There were also countless other resources your university provided to help you, like library resources or tutors. When you graduate and get a career, your boss will not be happy if your always asking for help and your co-workers have their own jobs to do, so don’t plan on much help from them either. Many professors become unofficial mentors to students in college and are always around to offer guidance and support. Don’t expect your boss to act like a mentor to you and certainly don’t plan on getting much support from them. In their eyes, you’re their support for when they need something done, that’s why they hired you. A popular used phase is “it’s all about who you know“, and it’s a very accurate one when it comes to finding a job. If you know someone who works in an industry that you would be interested working in, ask them if they would be kind enough to refer. You instantly build rapport and common ground with the interviewer because both of you have a common connection – the person you listed as your reference on your application. You establish credibility for yourself by having connections and references of well-know business professionals in your industry. I can speak from experience that by knowing the right people not only can help get your foot in the door, but can also land you the job. Almost 7 months after I graduated college, I went on interview after interview but failed to get the job every time. It seemed like I was never going to get a job. When my parents discovered how discouraged I had become with my job search, they told me to email the human resource manager at the company I now currently work for. In the email I sent, my parents told me to tell the HR person who I was (that I was their son) and that I was looking for a job. Less than an hour after I sent the email, I received a response and was able to set up an interview time. Then, less than two weeks later I had a job. I’m living proof that it’s all about you know. It’s important to thoroughly research the industry you want a job in. Know all the criteria, skills, and terms needed and used in that type of career. Taking the time to do the proper due diligence on that industry and learning the industries background will give you an edge on the competition. Employers and interviewers will also be extremely impressed by your industry knowledge. You want to constantly be networking to get referrals and references from other professionals who work in your industry. Networking allows you to create connections. Remember, who you know can do more than just get your foot in the door, but also land you a job. When constructing your resume keep it clean looking and clutter free. Employers scan over hundreds of resumes a day. You want to make sure your resume is easy to read, so the person looking over your resume (the employer) can easily find the key points and skills you’ve listed. Keep your resume relevant to the industry you’re seeking a career in. Placing irrelevant things in your resume that are unrelated to the job type your seeking only takes up space on the resume and makes it look cluttered. Also, avoid putting down part-time jobs you’ve had before college, especially if their not relevant job experience to the type of career your seeking. Do place on your resume any clubs or organizations you were apart of in college or currently affiliated with. Always include a cover letter with your resume. A cover letter supplements your resume by going into greater detail on your job experience and list key points on your resume. Your cover letter can also provides additional information not listed on your resume and explain to the person reading it why you would be a good fit for the job. Have your resume professionally written. Your resume is essential to your to the success of your job search. It’s the most valuable and powerful tool available to you, and having a good resume to send to employers will get you interviews. Employers receive a huge stack of resumes everyday and when they scan over resumes they immediately discard the ones that are unorganized and / or difficult to read. The only resumes they keep are ones that quickly catch their eye, professional looking, and the ones that stand out from the rest. When employers have finished scanning over all the resumes and discarding the ones that didn’t catch their eye (the majority of them). They then go back and fully read the resumes they kept in more detail. Only then will they make the decision to call a job candidate and set up a interview. If you’re not sure how to make a resume or want assurance that your resume won’t get discarded, companies like ResumeWriters and ResumesPlanet offer professional resume writing services. Have your entire resume professionally written for you. If you already have a resume, have it professionally reviewed and looked over for any errors, clutter, or incorrect formatting and have any necessary corrections made to your resume. Is there a professional certification you can receive that could significantly boost your resume and chances of getting a job? If there are any professional certifications available for your career it’s worth the small investment to get it. Especially if you know you will have to get a certain professional certification later on down the road anyways. Most professional certifications can be received directly online quickly and many cost less than $100. Websites like 360training, Pearson Education, and Lynda.com all offer a variety of professional certification courses you can take online. Being able to place a professional certification on your resume instantly gives you an edge and employers will prioritize your resume over others without that professional certification. Employers prefer to hire candidates that already have all the necessary certifications because they’re already certified to perform all aspects of the job. It also saves the company money that they would otherwise have to spend getting a new employee professionally certified. The only way you’re going to get a job and continue getting leads and interviews is to apply for jobs. Use employment websites and job search engines like Beyond, WantaNewCareer, and SnagAJob to upload your resume, find job openings, and apply for jobs. You can also use social media sites like LinkedIn to search for jobs in your industry and network with job recruiters. Some jobs will require you to fill out an application and others will just ask for a resume and cover letter. If you have to fill out an application be sure to upload or send in your resume along with the completed application. If the job your applying for only asks for a resume and cover letter, make sure you create a unique cover letter specifically for each job you apply for. After you set an interview date and time, you’ll want to begin preparing for the interview. By doing thorough research of the company and it’s background for the company you have an interview with you’ll be able to easily answer any questions the interviewer throws at you about the company. You can find out information about the person who will be conducting your interview by looking up their profile on LinkedIn. Having some background information about that person will make you feel more confident going into the interview. You’ll be able to immediately build rapport with that person and even flatter them by mentioning any career accomplishments they’ve had, or anything else you’ve found out about them. You can go to Glassdoor.com and read reviews written by individuals who have interviewed with that company in the past and reviews written by people who are currently employed with that company. You can also find common interview questions the the company asks in interviews from people who have interviewed there in the past. Sometimes they’ll even tell you the best way to answer the questions. Glassdoor is also a great resource to research current salaries received by individuals who currently work for the company. This is valuable information if you’re offered a job. You will be able to negotiate your salary by using actual salary figures they’re currently paying to their employees working in similar positions to the job they offered you. When I had an interview for an internship in college as a financial adviser, I used Glassdoor as a resource for my research and preparation process. I was able to find out many of the questions the company ask interviewees and the best answers to the questions. This made preparing for the interview a 100 times easier and I was amazed to find that most of the interview questions I found on Glassdoor were the exact same questions word-for-word that were asked in the interview. I remember one of questions I found on Glassdoor that was also asked in my interview was “do you want to own your own business someday?“. The person who provide the interview question also provide the appropriate answer, which was “yes, I do want to start and own my own business someday”. Now, this can be a confusing question for the person being interviewed, because without knowing the correct answer upfront you wouldn’t know what interviewer was trying to determine from the question. Where they asking that question to figure out whether or not you you would be fully committed to the company if they hired you, or would you eventually just leave for another opportunity, such as starting your own business. Or, were they asking that question because working as a financial advisor is similar to running our own business. The reason the company asked that question to the people it interviewed was for that later of the two reasons. To determine whether or not a candidate was business minded or not. Working as a financial advisor was similar to running your own business. Many candidates they interviewed did get confused on how to answer that question and if a job candidate answered the question wrong by answering “no” or hesitated to answer the question, that candidate was immediately disqualified from moving on to the next interviewing stage. That was one of the interview questions was asked in the first interview screening stage of the three interviews of the company’s interview screening process. I made it through all three interviews and ended up getting that job as a intern, which at the time was rated one of the top ten internships in the country. As you can see from by example, doing the proper research and using resources like Glassdoor will significantly make you more prepared and help you stand out from the competition. After a job interview, follow up by sending thank-you letter. It can be sent as an email or a hand written letter, either one is fine as long as you send it. Following up after a interview with a thank-you letter lets the interviewer know you’re seriously interested in the job and they’ll appreciate hearing back from you. You should send a follow up thank you letter within twenty-four hours from the time of the interview. I hope this helps you with your job search. How did your job search go after you graduated? Did it take you awhile to find a job? If you struggled finding a job, how did you overcome those struggles?